He made this observation in the latest version (7th) of his Radiation Contour Map released in July, before the Fukushima prefectural government sheepishly published the data from the monitoring posts in Fukushima taken in March last year, which does show the spikes in radiation in locations in Fukushima Prefecture not after the explosions but after the change in the reactor pressure after the vent. Professor Hayakawa of Gunma University first put up his hastily charted map on the Internet on April 8, 2011, after the Fukushima prefectural government announced the result of the radiation measurement in schools and kindergartens inside Fukushima. The first version of the map was released on the net on April 21, 2011. I remember seeing it, and also remember he was attacked for "fear-mongering". It was around that time that Iitate-mura was officially designated as "planned evacuation zone". The map is now double-sided, and on the backside he put the map comparing the contamination from the Chernobyl accident and and that from the Fukushima accident; he also put the chronological map of contamination. The map is available online free, like all the previous versions, but this time the printed version is being actively sold in the physical world (for 200 yen in Japan), so that people who do not have access to the net can purchase. From the tweets that I see, it's off to a good start. Eat, not eat. Go, not go. Escape, not escape. Do, not do. Stop, not stop. Decide for yourself. There is no right or wrong answer to measures against radiation contamination. How to cope with radiation depends on personal circumstances. This map shows the dose rates of locations where radioactive materials that fell on the ground surface in March 2011 remain undisturbed. The values are as of September 2011, in microsievert per hour (μSv/h) at 1 meter off the ground surface of either turf or grass land. Radioactive materials get washed away from the dirt or asphalt surface by wind and rain, so the dose rates on these surfaces tend to be lower than what’s shown on the map. On the other hand, radioactive materials accumulate in rain gutters, on the ground under the roof overhang, in side drains, and on the side of the roads, resulting in the dose rates several times higher than what’s shown on the map. In the afternoon on March 11, 2011, a huge earthquake and tsunami that happened in the Pacific Ocean off the coast of Tohoku destroyed Fukushima I (Daiichi) Nuclear Power Plant. For two weeks, a large amount of radioactive materials leaked from the plant. Areas as far away as Iitate-mura, 40 kilometers northwest of the plant, got severely contaminated. Nakadori (middle third) of Fukushima Prefecture, and the northern Gunma and Tochigi were also badly contaminated. Eastern part of the Tokyo Metropolitan region and southern Iwate were also contaminated. In the map on the front page, there are 8 levels of isopleths with the maximum at 16 μSv/h: 16, 8, 4, 2, 1, 0.5, 0.25 and 0.125. Needless to say, the radiation contamination extends beyond the 0.125 isopleth. In the evening of April 8, 2011, the Nuclear Team of the Disaster Response Group of Fukushima Prefecture announced the dose rates at 1,648 schools and kindergartens in Fukushima. I found the data on the Internet, and picked one or two high numbers in each municipality, plotted on the Google Map, and made the map public that day with the three isopleths of 8, 2, and 0.5. That was the first of the radiation contour maps. Ms. Sachiko Hagiwara beautifully stylized the map, and it was published on the Internet on April 21, 2011 as the first version map (upper right). I continued to collect information, and published the revised version on June 18, 2011. This version was the first to show the contamination in northern Tochigi and Gunma, eastern Tokyo Metropolitan region, and southern Iwate. I revised the map every 3 months, and the current map is the 7th edition. This time, in addition to publishing on the Internet, I have decided to print on paper so that the map becomes more widely available for people who do not use the Internet. What determined the distribution of radiation contamination was the wind. Volcanic ashes from the volcanic eruption are transported by the wind at a high altitude of several kilometers and higher. However, radioactive materials leaked from the Fukushima I Nuclear Power Plant were transported by the wind near the ground surface. Looking at the meteorological data from that time period, wind directions at an altitude of 1 kilometer and higher cannot explain the distribution. I believe radioactive materials were carried by the surface wind whose altitude was dozens of meters off the ground at most. That’s the reason why the isopleths of radiation seem to follow the ups and downs of geography, such as basins and mountain sides. The radioactive cloud that passed over Minamisoma City in Fukushima Prefecture at 9PM on March 12 continued past over Sendai Bay and reached Onagawa-cho in Miyagi Prefecture at 2AM on March 13. The contamination on March 15 was the worst. The radioactive cloud that passed over Iwaki City in Fukushima Prefecture at 4AM reached Kanto Plain at 6AM. Since it was not raining, the cloud then headed west and north until it hit the mountainous regions in Kanto and northern part of Gunma and Tochigi Prefecture, where, for the first time, it rained, and radioactive materials came down on the ground with the rain. The contamination of Fukushima Nakadori (middle third) also happened on that day. Radioactive materials that crossed the Abukuma Mountains came down with the snow. In the afternoon, a particularly dense radioactive cloud was spewed from the nuclear plant. Carried by the wind, it went straight in the northwesterly direction, and contaminated the areas all the way to Iitate-mura, which the cloud hit at 6PM. In the evening of March 20, areas near the Miyagi-Yamagata border and southern Iwate were contaminated. Then, the wind turned south, sending the cloud past Mito City in Ibaraki Prefecture at 6AM on March 21, and reaching Shinjuku, Tokyo at 9AM. For 3 days from March 21 to 23, the Kanto region had heavy, intermittent rains. Moderate contamination seen in the eastern part of the Tokyo Metropolitan region is from this time period. The dates and times of contamination that I have just explained above do not coincide with the dates and times of explosions that took place at Fukushima I Nuclear Power Plant. Unit 1 exploded at 3:36PM on March 12, and Unit 3 exploded at 11:01AM on March 14. However, it wasn’t at these moments when a large amount of radioactive materials leaked from the plant. Instead, the release of radioactive materials into the atmosphere seems to coincide well with the drop in the reactor pressure. Just below the chronological contamination chart, Hayakawa has an interesting map plotting the radioactive density (cesium) of fly ashes from the incinerators. Why is he interested in measuring ashes, "dirt on the roadside" (that's Hayakawa's way of calling what others have called "black dust"), and gutters where radiation levels are high? He answers, "First, in locations far away from the plant, you can clearly see the extent of contamination by measuring them. Second, by identifying them, you can clean them effectively." It looks he plotted the highest measurement found in these locations. If you are in Japan and if you read Japanese and want to purchase, Professor Hayakawa has set up "Kipuka Spirit Shop" where you can make an online purchase of this map in A-2 size. There are other "authorized" retailers listed on his blog post, here. The English version will come later (if I finish the rest of the translation, it seems). I hear that the map looks very good on iPad or other tablets. His digital map remains free of charge for non-commercial use. If you use part of his map to create a new map, it is free, even for commercial use. Hayakawa says he doesn't claim copyright for the title and text, but he claims moral rights of the author. Great work by Prof. Hayakawa and EX-SKF -- thank you!! It'd be nice if people would actually try to seriously consider information BEFORE they resort to attacking everyone with stupid accusations like "fear-mongering" or "spreading baseless rumors". I left the Kanagawa area on March 19 with my kids. My husband told me not to panic, but having read this, I am so glad I took them out of there. I am so angry with the government for not informing us, not warning us -- in fact, encouraging us to stay. Great work, both Hayakawa and LaPrimavera. 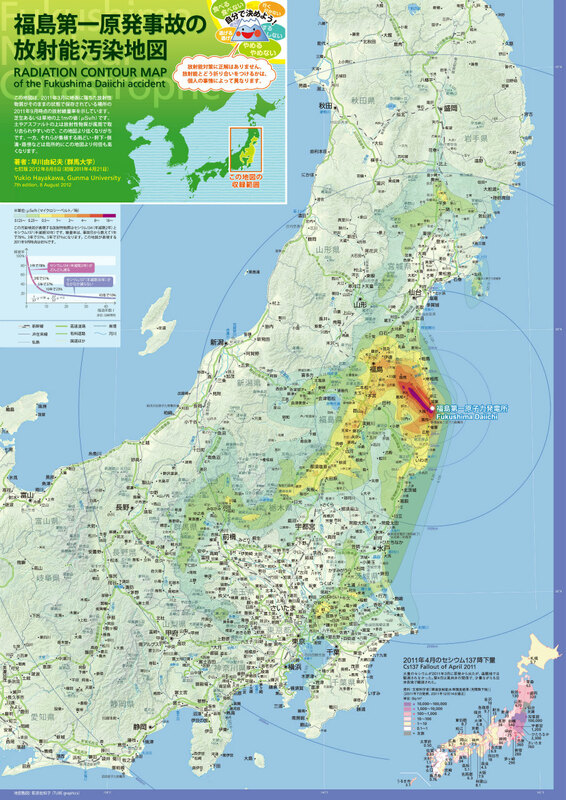 Based on Hayakawa's roadside cesium map, I created and published in my blog one myself, describing a massive danger or "no go" zone in Eastern Honsu. I would not like to be too exaggerate or "fear-mongering" but I have clear that the risk is very serious and is there, notably for children. So I would appreciate criticism and feedback. Thanks in advance. let's just home this won't encourage more "accidents" in the world ... you know ... some nice japanese professor is going to come to the rescue with a nice map, so we won't step into radioactive dog poo. There's a difference between "panicking" and "rationally analyzing the situation in order to determine an appropriate course of action, with priority on safety and survival". This is just my opinion, but I think leaving areas close to nuclear plants (especially ones that are not functioning correctly) leans heavily towards the latter. Sadly, most people (especially those in government) seem incapable of differentiating between the two! @Anonymous 04:13 who left Kanagawa: did you leave Japan entirely or simply the Kanto area? I also left (Tokyo) asap after 3.11 with my family and then Japan entirely a month later. It has been rather difficult to deal with this all as it seems like it was just a bad dream since there is no real talk of it in the media anymore and people here do not talk about it. Adding to this that people in Japan seem to be going on with daily life as though nothing has happened. It is very depressing to say the least and we want to return to our lives there but still feel that it is just as unsafe as before due to the spread of contamination in the air, water (ocean and water table) and food supply chain. I hope one day in the future we can go back but I fear I will be an old man by that time and who knows what Japan will be by then. the "baseless rumours" critics are little more than nazis. its quite sad to see japan come to this. it exacts a full look at the worst.- T. Hardy. Where are Japan's real leaders and Statesmen? This nation is little indeed if nobody confronts the problems head on. Come on Japan, I expect(ed) more from you. These are your people and this is your land. Where is your moral courage? Subsumed in debt and years of nepotism?? This is where an Emperor with a voice would be welcomed. Fook the politicians and their petty antics. Japan should be Great, not a wimp and a courtesan to power cash. Glad to see some people talking about having left. Everywhere I go, I seem to see people moving to Japan or going there for vacation. I even tried to convince people I know to not go, but nobody listens because they think they won't be affected, or they think the mainstrean media would tell them if it was really a serious issue. HA! Yeah, right. Of course, I know it's not easy for Japanese people to leave their entire country behind. I don't want to see Japan collapse or vanish, either... but it'd have been better if the entire country evacuated together, instead of only a few. "Where are Japan's real leaders and Statesmen?" Where are the World's statesmen?! I fear that we live in a period in which such class of people (if it ever existed) has vanished or has been marginalized into nothingness. The system only allows for yes-men and leaders of any kind or level must be able to say no, big noes to powerful interests like nuclear, oil, etc. They don't dare, they don't know how and they possibly cannot at all. The corporations rule it all and are led by simple-minded opportunists without no sense of collective responsibility. I for one think that such extreme would not be necessary if the Japanese government would have acted with cold head and rationally: only some areas (specially Fukushima) would have needed to be evacuated and radiation contained in them. Much of the hotspot radiation could well be kept under control by means of properly organized decontamination and radiation control and, very specially, by not disseminating radioactive materials from Fukushima intently, as they are doing. But it would need serious managers, statesmen, not the lot of corrupt petty politicians who rule almost everywhere these days, relying only on the persuasion power of the corporate media and the repression power of the police. Anyway, the maps are OK. I don't know if people realize that the professor is just using official data and that similar contamination maps were released by the government last year. "... similar contamination maps were released by the government last year". Similar to the first one (atmospheric) but restricted to certain departments (excluding Greater Tokyo for example) and with a more tranquilizing color code all in green and blue shades (almost no red/orange/yellow because the government wants to transmit that all that contamination is almost trivial, when it is very dangerous in fact. Also his map is older than that of the government. The government is going behind citizens (not just Hayakawa but also other citizen networks and associations) in this: when they should be leading citizen protection, they are hiding and pretending instead, behaving as irresponsible, immature, purely selfish petty characters and not the mature, altruistic leaders that every people imagines to have, specially when faced with such big existential problems. I'm not aware that the authorities have released any map of ground contamination and I've been following this matter with all possible intensity, thanks to blogs like this one, since day one. "the Soviets evacuated areas over 555,000 Bq/m2"
Hmmm... The confiscated/closed zone is actually defined by 1.48 billion Bq/km², which if my maths still work, translates as 1.48 million Bq/m², approximately three times the figure you mention. He probably meant the Permanent Control Zone and something was missed. Not that it matters much because they should have evacuated much of Belarus and large nearby zones of Ukraine and Russia for what I know: children are suffering extreme illnesses and will suffer them because this was not done. You may protest: "you cannot evacuate half a country like Belarus nor a major urban area like Kiev" but that's like saying "you cannot build nuclear power plants" in fact: because it is one thing what causes the other, not my or Hayakawa's observations. Whatever the case, the USSR did evacuate important areas around Chernobyl NPP and further NE, based on radiation measures. They also managed to contain the source of the pollution and encase it. Instead Japan, with a much more complex and unsolvable problem, but also starting with a more advanced technological level, has decided that only a tiny area around the plant itself is closed and has allowed and encouraged the return of citizens to the areas initially evacuated. The USSR did it badly but Japan is doing even worse. Hayakawa was attacked for the map when he first released it in April, because he visualized the government data in a way that people could related to and understand. It's one thing to see the rows and columns of numbers on a table, it's totally another to see it as a map. Fukushima residents as Aum Shinrikyo believers, that came later. I did not, and do not agree with his stance on disaster debris burning, but no one's perfect. I've given up on him on that, and temporarily unfollow him on twitter when he starts to babble about debris. You can't fit him to your liking 100%. As to his map using the government data, the point of creating a map is to visually organize data, information, your interpretation of the data and information, your intuition, and other facts, ideas. Given the same data, people will make totally different maps. It's not just what data is presented, but how it presented, all the way down to what color to use. Any of you who have done the Arc GIS from esri would know. Or map creation in high school geography. Many people understand his map, far better than they understand the maps by the Ministry of Education. I don't think it's a problem of people understanding the maps or not. Many people understand the official maps, but if you are focusing on the group surrounding the twitter accounts of not only Hayakawa, but also full psychos like Kinoshita or Ono Dekita, then yeah, I understand if you get that impression. What is a bit puzzling is the fact that people that would not go near TEPCO's or MEXT's website or even read a newspaper (cause they are "lies"), do happily accept the same information as long as it's being delivered to them through a different source which they perceive as trustworthy. I assume you have perceived the same phenomenon with sites like enenews or your own blog. Based on some of the comments, I don't know if people realize that most of the content are just translations of news reports from the evil mass media in Japan. I don't think you know much about what the Soviets did after the accident in Chernobyl and, based on the fact that you are "not aware that the authorities have released any map of ground contamination," I have to assume that you are not, in fact, following the situation very closely. I mean, either that or your sources of information are awful. About the evacuation criteria the Soviets used, there were several phases. First they established an exclusion zone in a 30km perimeter, and it took them between 2 and 3 weeks to evacuate around 90,000 people there. Based on this, they evacuated areas further to the NW in Belarus and Russia, but they also promoted measures to either encourage people to stay or to grow food in their old fields. However, at the time all the information about food and soil contamination was kept secret and was only released to the public in 1989, shortly before the visit by the IAEA. The social uproar forced the authorities to create new standards, including new planned relocations based on a soil contamination limit of 555,000 Bq/m2 (again, Cs-137 only) which was included in a new law issued on February 1991. This didn't mean a lot, though, since the USSR collapsed and the plan was not fully implemented, specially in Belarus, where 280,000 people were still living in areas designated for evacuation well within the 90s. As you see, this was a complicated process which took time and during which measures that were established by law ended being irrelevant in many cases. All these factors were ignored by Hayakawa when he started making comparisons between the reaction of the Japanese and Soviet authorities after both accidents, meaning that, for example, he was comparing the 20 mSv/year evacuation limit established by the Japanese Government one month after the accident with an evacuation criteria of 555,000 Bq/m2 which the Soviets established in 1991 but did not implement. Anyway, now we would have to mention how the Japanese 20 mSv/year limit was translated into an hourly dose of 3.8 uSv/h based on a series of assumptions of time spent outside and shielding factor while indoors, but since I don't really understand how the Soviets reached their 100 mSv year limit based on an hourly dose of 30-50 uSv/h, it wouldn't be useful for a comparison. Yeah, it's saddening that we can't agree with anyone 100% on everything. You'd think that if people had the same motives in mind, they'd be able to reach the same conclusions. and my comment about cartography is based on my actual experience from high school geography, not esri. If more people get the information of radioactive contamination because Hayakawa's map is easier to grasp than official government statistics in tables or poorly designed maps, that's great. Anon above, map at your link isn't made by the ministry of education. Besides, what do you do when you don't have access to the net? I do not think that we are in disagreement. You seem to be well informed and know details that I did not know (or I still do not know because instead of informing, sometimes you accuse of ignorance and leave the matter at that, what is not constructive). If what you mean is that Japan is doing things not worse but only-as-bad-as the former authoritarian USSR in the 1986-89 period or the current totalitarian Belarus since 1991, you may well be partly (not totally) right but it still says nothing good about the criminal mismanagement of the Fukushima disaster, which is at least 4x as perilous as that of Chernobyl, not just because of the number of reactors affected but also for not being apparently possible to encase them and for being just by the sea. In Chernobyl at the very least they managed to encase the problem, in Fukushima there seems to be several ongoing China syndromes. Also, in Europe draconian measures were decreed on food safety and, regardless of what Belarus did, food from the affected areas was never allowed elsewhere, at least not in nearby EU. In Germany and other parts of EU even to this day and for all the foreseeable future, many food safety measures are still implemented, affecting mushroom collection or boar hunting for example. And Germany is at least as far from Chernobyl as Korea is from Fukushima. Using the worst practices as model is not going to work, although I know it's common mentality in business, this is not private business but social management (aka politics), a much more delicate area which should oversee and not just bow slavishly to the private sector. "... I don't know if people realize that most of the content are just translations of news reports from the evil mass media in Japan. ..."
I would suggest that you try for a week to do what laprimavera does so that you'll see for yourself just how much work it is. Maybe then YOU would realize that it is so much more than "just translations." And even if it really came down to being "just translations," I'd still be grateful to laprimavera for his countless hours of effort and work to provide information that would otherwise not be accessible to non-Japanese-speaking people like me. My silent thanks go to you, laprimavera, on a daily basis! I'm not saying that the reaction of the Japanese government was only-as-bad as the one from the Soviets, I am saying that it was better at all levels, from transparency to evacuations to counter measures. Just compare watching the explosions on TV a few hours after they happened, after receiving regular updates on how the reactors were losing cooling capabilities or how the water levels were dropping, air radiation levels on-site reported two time a day, air radiation monitoring stations off-site accessible on-line the whole time (www.bousai.ne.jp), fallout levels by prefecture daily since March 14, air contamination levels daily since March 15, results of food and water contamination tests daily since March 19, and so on. Compare that with a single sentence on the Soviet TV a couple of days after the reactor exploded leaving a hole in the ground and people living in contaminated areas with no information for three years. Faster and based on more conservative limits in the case of Japan. As I mentioned on my previous post, compare 20 mSv/year Vs 100 mSv/year with much higher hourly dose allowed in the case of Chernobyl (3.8 Vs 30-50 uSv/h). Extended evacuations started around 3 to 6 months in the case of Chernobyl and it took the authorities 3 years to recognize areas which were heavily contaminated, and more than a decade to get people out (and sometimes not even that.) In the case of Fukushima, evacuation of Iitate and NE Namie-machi were decided on April 22 and completed by the end of May. Lower contamination limits allowed in food after the accident in Fukushima. 500 Bq/Kg as the general limit for the first year and 100 Bq/Kg after April, 2012. About the "draconian measures" related to food contamination in Europe, I don't know what your sources are. The allowed limits of contamination in western Europe were also higher than the Japanese ones and food testing was less prevalent. One example is Sweden, which only tested milk and pasture. As a result, daily intake of cesium in two of the less affected countries, France and Germany, was higher one year after the Chernobyl accident than it is today in Fukushima Prefecture. In short, France and Germany, around 10 Bq per day of Cs-137 (only) in 1987 while Fukushima residents average less than 1 Bq per day of both Cs-137 and Cs-134 in 2012. The Soviets tried to present emergency operations at the plant like something heroic, when they were mostly unnecessary and didn't have any effect whatsoever in the outcome of the accident. I could go on and on, but the question is that anyone who has spent 15 minutes researching about both accidents knows that the Soviet response was far worse. This doesn't mean that the Japanese response was good, but criticizing without knowing the facts goes nowhere. Fukushima residents getting less than 1bq/kg a day? Where did you get that data (or idea)? But... if almost nobody has been evacuated in Fukushima and those evacuated initially have been insistingly invited to go back! If children are going to school with dosimeters because those schools are heavily contaminated and they can't go out to play for the same reasons! It is true that in the first days we had better access to direct info re. Fukushima II while the USSR was most secretive instead. But that only affects the first days or weeks: later on it is exactly the opposite: the USSR became more transparent (not just re. Chernobyl) while Japan has become secretive, in a sick and futile effort of extend and pretend at the expense of Japanese people primarily. This results in confusions like the ones you fall into: the European measures are becquerels per yearly diet of one avg. person, which are never >2 for Cs137, while the Japanese measures are on average (look at the graph) c. 25 Bq/kg of actual food (see the graph: never under 10, sometimes even above 40). 1 Bq/kg is only the lowest measure limit of the detecting method, so <1 Bq/kg would not be detected. "The Soviets tried to present emergency operations at the plant like something heroic, when they were mostly unnecessary and didn't have any effect whatsoever in the outcome of the accident". You must be joking: while the encasing is obviously not any permanent solution, it has avoided further contamination of air and water (they also encased it from below). Probably this was not an option in Fukushima II because the water table is just too close to the reactors (awful design) but don't tell me that the Chernobyl encasing is not preventing more extensive contamination and the impossible to control China syndrome, which is ongoing in Fukushima II. Not at all. Given the objective contamination, most of Fukushima Pref. should have been evacuated since day one, at the very least the children, and contamination attempted to be contained in that area. The authorities did exactly the opposite: sacrifice the citizens (children included) to a slow horrible death to save the highway and prevent hypothetical zillions on damage payments from both TEPCO and the state. Spreading the contaminated debris and food around has only helped to contaminate beyond what should be the contention area of Fukushima Pref. Of course, I reckon (something you don't, Anon who defends the Japanese gov.) that the problem is so big that there is a lot of "damned if you do, damned if you don't": any decision seems bad because the problem is huge and has no good solution. But the logical thing by all accounts was to evacuate the worst affected areas like Fukushima city and most of the rest of the prefecture, and try to decontaminate the less affected areas like Greater Tokyo instead, which are practically impossible to evacuate. It is also very important to keep the information exhaustive and transparent, so people can judge and make the correct decisions with all the data before them. Instead the limits of allowed contamination have been pushed upwards, medical facilities are forbidden to make tests and radioactive contamination maps are cut at the access to Tokyo and painted all in pastel green colors suggesting that everything is alright when it is not, not at all. The management of the nuclear crisis has been in this year and half most criminal and mafioso, with only two goals in mind: to keep the Fukushima corridor populated and active no matter how many children must die with horrible agony and not to pay a single yen in indemnities if possible. When comparing the responses to the two accidents, one probably also has to take into account that 25 years have passed between the two accidents. Japan had (or would have had - am leaning to agree more with maju) by far better technological means available to measure, test, and disseminate information to the public and hence protect the public than Russia did. The lack of links to support anything you say it's interesting. "This doesn't mean that the Japanese response was good"
"the Japanese response was good"
About your interpretation of the charts, the European data are not "becquerels per yearly diet." The charts clearly indicate Bq/day/person (Bq d p). This is for Cs-137 only. About the Fukushima data, you are right that they are in Bq/Kg, not per day, sorry about that. So, to correct my previous post, the highest detected this year in Fukushima Prefecture meals was 3.2 Bq/Kg of both Cs-134 and Cs-137 combined. Assuming 1.5-2 Kg of average food intake per day, the HIGHEST intake per person per day based on that data would be between 4.8 and 6.4 Becquerels of both cesiums, while the AVERAGE would be less than 3 and 4 Bq/person/day because of the detection limits. Compare that to the AVERAGE daily intake in Berlin and Avignon, which was between 9 and 10 Bq per person per day at the beginning of 1987. Yes, the food monitoring system in western Europe was "draconian." Finally, about this, "given the objective contamination, most of Fukushima Pref. should have been evacuated since day one." I may agree in that kids should have been taken out of the 80 km perimeter, but the Soviets would have never evacuated those areas. Possibly they would have not even evacuated Iitate-mura, for example, based on their 30-50 uSv/hour limit. They would have let the people there, no information about the contamination whatsoever, and 3 years later they would have told the population that they had been living in areas over 555,0000 Bq/m2 of Cs-137. 2 years after that, they would have come up with a law establishing larger evacuation zones to the NW of the plant, but since they had ran out of money, people would have remained there anyway. Again, the Japanese response was not good, but comparing it to what the Soviets did is not the way to criticize it. By the way, read the article by Alexander Sich if you still think that the sarcophagus prevented anything, or that the dumping of sand, lead and boron actually reached the molted core. Sorry about the misquote, mr. Talkative Anon. but it seems I was having my morning coffee when I wrote that and you had me reviewing several misinterpreted technical reports before that, what surely tired my neurones more than two sips of coffee could correct. In any case your general tone is apologetic of the Japanese management, specially by distorting the comparison with the USSR and Europe, even to the point of claiming major falsehoods. I was willing to believe, probably because that coffee abstinence syndrome, that your total distortion of the Japanese and European sources you yourself provided (why would I need to add any link if my sources are the same as yours, just that correctly read?!) but you seem to insist on error, not acknowledging that even if the Swedish 1994 diet data (not too clear if that was actually available for ingestion or was before removal of most contaminated sets) was in no higher than 1/20 of the Japanese diet data you provided. Why is that? Because Chernobyl was soon contained in a complex engineering encasement, why the Fukushima monster is still "free". Sweden was very much affected by Chernobyl anyhow, being the first state to detect unusually high radiation levels outside the USSR. I do not recall the details but I know that international and internal pressure on this matter specially triggered the famous "glasnost". Even if the soviets wanted to keep their radiation data hidden, other countries would not allow them to, and overall we knew what kind of stuff was coming outside Ukraine: the radioactive cloud that was encircling the globe, the radiation levels almost instantly and soon also a tight control of radio-contamination in food. Today, and that's not the fault of Japan certainly, the USA, China, Korea, Russia, Taiwan, Canada, etc. essentially collaborate to hide the problem and pretend that almost nothing happened. "the Soviets would have never evacuated those areas". Maybe. That's why the children are suffering. I don't know how many Chernobyl documentaries you have watched but I have seen several and all those that deal with the "children of Chernobyl" are absolutely heartbreaking. For me that's almost worse than the Holocaust. I repeat that the Fukushima meal data you quoted is for Potassium-40. Unless you are referring to WBC data, in which case you don't understand it, since a daily intake of a few Bq per day would make internal contamination increase, not decrease like they have observed in Minamisoma. About the glasnost, it was one of Gorbachev's main principles, but it was that a principle and it didn't affect the public release of Chernobyl data until 3 years after the accident. As for the articles you present to support the possibility of a China syndrome, mainly enenews and fukushima-diary and one article from this blog about the suppression pools for some reason. Note how many of them predicted several months ago the imminent occurrence of such event, or how they ignore essential details like the amount of decay heat present in the corium now (after 20 months) or the several meters of concrete under the containments, etc. This was not, however, a result of the actions at the time, since the liquidators were not able to reach the corium. Compare that to the reactors at Fukushima, which were scrammed and cooled at least during the first hours or days in case of No. 3 and 2. Probably you don't understand what decay heat is or why the first hours and days are more important, though. "It doesn't really matter, since Chernobyl's reactor No. 4 exploded while it was still in operation and the radioactive lava didn't reach "the water table" or anything similar". You have no idea how they did to prevent the corium, which is still burning and will be for the following millennia, from (temporarily) penetrating the floor. In Chernobyl they did basically three things: (1) pouring tons of sand on the corium/reactor (as coolant and first radiation shield), (2) digging under the reactor and building a new "floor" under it, (3) encasing the top of it. "... the liquidators were not able to reach the corium". It also mentions how some Western powers became refractory after a while to "believe" the newly adopted sincere information coming from Moscow (because it threatened their own nuclear programs and the beliefs invoked to support them). Actually the corium does not ever get cool because it is an always ongoing nuclear reaction. Room temperature? Not at all: neither in Chernobyl nor in Fukushima: permanent cooling would be needed or, as it is planned (but not yet funded) for Chernobyl a new encasing around the first encasing just to resist another century or so... And then? Who knows? Another even larger encasing like an infinite matriushka doll? Radiation is forever (or almost) but our containing methods are not. In Fukushima, continuous washing of the corium units with seawater delays the reactions probably, but eventually the water leaks to the underground or evaporates, so it's much worse as containment than the Chernobyl encasing. Never mind that it must be added once and again: it may delay the worst of the China syndrome but it's not solving anything, much less "cooling" the corium, what is impossible. It is impossible to effectively cool the corium (in a reasonable time-frame) because the internal reactions keep it "burning" no matter what: it has nothing to do with temperature in fact, temperature control is only for its environment, to prevent that the corium ignites everything around and makes things go kaboom even more. Once the slow uncontrolled nuclear reaction has begun it cannot be effectively stopped: it won't normally explode as a nuclear weapon but will keep "burning" for millennia and may cause hydrogen or steam explosions, loaded with radioactive materials. As for the Japanese language graphs, I can't be sure because it's all in Japanese and I needed Google Translator to understand it but the graph in this page appears to show a median of 25 Bq/kg or more. The chart on that page shows the concentrations of different isotopes, with the green bars representing Potassium-40. You may not be able to read the katakana, but I guess you can read the numbers. About the corium, the idea you mention that it "does not ever get cool because it is an always ongoing nuclear reaction," it's misleading. Decay heat is produced by fission products and transuranics undergoing decay. Transuranics have long a half-life, thus the main source of decay heat are the fission products. Since most of the fission products are short lived (between microseconds and a few hours or days), the amount of decay heat and consequently the need for cooling is critical during the first hours/days. After that, the amount of decay heat generated is just a fraction of the original value. This means that the corium does not retain enough heat to melt through either concrete or steel, so if it didn't happen during the first week, the China syndrome is not going to happen 20 months after the criticality stopped. See the steel pipe around the corium? It's still there, right? That's because the corium does not retain enough decay heat to melt through it. So, in short, the miners finished the tunnel a couple of months after the accident and added a couple of meters of concrete under the basements. At that time, however, corium had already cooled down enough and it couldn't reach the aquifer under the plant. It's still there in the basements of reactor No. 4. Now, consider that in Fukushima there are already several meters of concrete under the steel barriers of the containment, that the fuel had already been cooled for a few hours in the case of reactor No.1 and a few days for No.3 and specially No.2 before it melted, and combine that with the curve of decay heat to get the whole picture. I don't know if Legasov advocated releasing more information to the public at the time, but in any case that would be an example of individual courage, and it doesn't change the fact that all information about soil and food contamination was kept hidden from the public during the first 3 years. "This means that the corium does not retain enough heat to melt through either concrete or steel, so if it didn't happen during the first week, the China syndrome is not going to happen 20 months after the criticality stopped". This claim has two serious errors: (1) the erosion is not primarily because of heat but because of radiation and (2) the criticality never stopped, it's a myth, it's something that TEPCO/Japanese Government invented in the anniversary of the disaster to tell the media in the hope that many would believe it like they believed in Santa when they were children, against all evidence, evidence which they would rather not wish to exist to begin with. Anyhow I do not know why you insist so much in temperature since once the criticality is active (and never really stopped) all the energy involved is nuclear radiation from the chain reaction - and this one cannot be stopped once the system broke, just contained to some extent. This is the same for Chernobyl as for Fukushima, only that we have less info on the exact situation inside of each Fukushima II reactors but the info we have suggest that several of them, if not all four (5 and 6 may be under control, unsure), are in permanent criticality status. It is unclear if one of the Fukushima I one reactors can also be in that situation. And radiation alone erodes almost everything, certainly concrete and electronic components. I did not mean as something apologetic of the Soviet reaction but as information on what was exactly done to contain the catastrophe, notably the issue of the subterranean encasement, which you seemed oblivious to. And in general I do not mean to be apologetic of the Soviet management of the crisis, I just think that in too many aspects the Japanese management is much worse. This is in part because there are no realistic options (the water table is probably too close to the reactor itself, so such complete encasement is surely unrealistic), then it is also because socialist societies work a bit differently than capitalist ones (no corporate interests, only individual and collective ones), and then there are political choices of course (but in such a corporate state as Japan, TEPCO and the industry dictated the terms). "At that time, however, corium had already cooled down enough and it couldn't reach the aquifer under the plant. It's still there in the basements of reactor No. 4". How do you know? And why (again) would you think this is a mere matter of temperature and not of erosion from radiation, which of course the corium is generating and emitting all the time. Where do you get that from: all I have seen are graphs with the containment. Concrete is eroded by radiation anyhow: it will contain nothing in the long run, just delay. I feel that you do not really grasp what a "China syndrome" is or how does nuclear fuel behaves after loss of control and transformation into corium - it does not explode because it's not designed to, but it keeps reacting "forever" because the critical mass is there all the time. Actually, if we could be certain that the corium buries itself in the mantle without causing steam explosions and the like, it could be a good hypothetical solution but in practical terms, the corium will continue reacting and irradiating and possibly causing several types or (in principle) non-nuclear explosions which only scatter the radioactive materials again into the atmosphere and hydrosphere and damage even more whatever containment devices we have built (prior or after the accident). And never forget this: nuclear power is for a few decades, the resulting radioactive contamination is forever. And they are not going to come from the past to clean up their dirty nuclear deeds: it is our problem now.